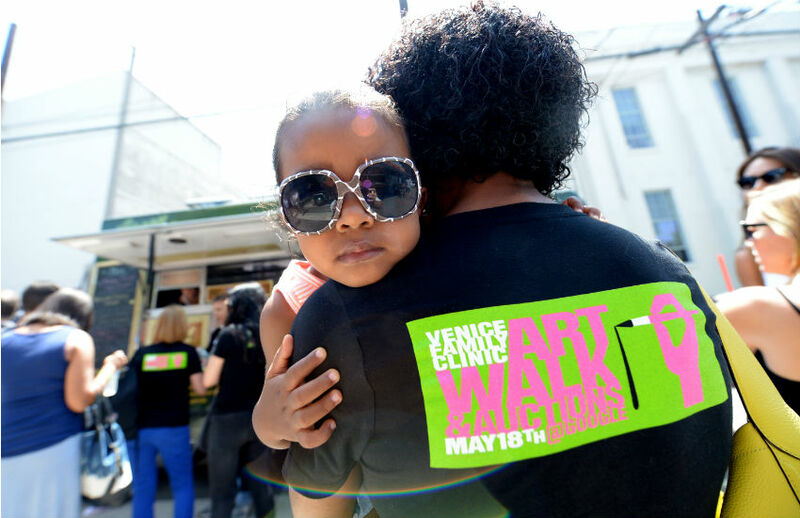 The Venice Art Walk, held at Google Los Angeles in Venice on May 17, is a fund-raising event that directly benefits the Venice Family Clinic and their patients. The clinic works directly with local artists to design an event that is representative of Venice culture. With this customized approach, studio tours and silent auction featuring hundreds of local artists, the clinic raises nearly $700,000 annually to provide health care services to 20,000 uninsured patients, some of whom are homeless. Founded 36 years ago by a group of artists who wanted to help the Venice Family Clinic, the idea is simple. Artists open their studios for a ticketed tour and donate the profits to VFC. During the late 70’s and early 80’s artists like DeWain Valentine, Robert Graham, Laddie John Dill, Ed Moses, John Baldessari and Ed Ruscha decided that the clinic was a social cause they were willing to organize around, and today there is an exciting new crew of artists taking on that task. With over 350 pieces of art available in the silent auction, it is clear that many artists believe in the Venice Family Clinic, but it takes a major commitment from a few select artists to rally those forces. The Venice Family Clinic’s Chief Development Officer, Laney Kapgan, notes that, “It’s hard when the artists of the past start something and you don’t know who is going to carry the mantle. If you don’t bring in the next generation of supporters an opportunity goes away.” Fortunately, three artists, Analia Saban, Jacob Kassay, and Sam Durant, stepped forward and are currently carrying the torch. Jacob Kassay moved to Venice four years ago and immediately got involved with the clinic. In that short amount of time, Kassay has already donated his work for the auction, opened his home as a gallery space for the Art Walk, and dressed up, with is wife, as an elf to give out toys at the Venice Family Clinic’s annual Children’s Holiday Movie event, which has been taking kids from low-income schools and homeless shelters to see movies in theaters for over 25 years. All of the art on auction is available for viewing at no charge from noon to 6 p.m. at Google Los Angeles in Venice. The art is also available online for viewing and pre-bidding here through May 15.